Nim’s hair was wild, her eyes were bright, and around her neck she wore three cords. One was for a spyglass, one for a whorly, whistling shell, and one for a fat red pocketknife in a sheath. With a spyglass at her eye, she watched her father’s boat. It sailed out through the reef to the deeper dark ocean, and Jack turned to wave and Nim waved back, though she knew he couldn’t see. Nim’s Island by Wendy Orr is a fun little tale of a girl named Nim and how she copes with being alone to care for herself when a sudden storm catches her marine biologist father at sea, damaging his boat and preventing his return. Equipped with the modern technology while living in an island hut, Nim answers her father’s email from Alex Rover, the reclusive and mysterious, world-famous adventurer and author. After receiving Rover’s questions regarding coconuts floatablity and usefulness in building a raft (the planned escape for Rover’s hero in the next book), Nim helps answer Rover’s inquiry… glad of the diversion while her father’s away… and in the process developing a friendship with Rover. However, as the days go by without the return of her father and an infected injury to her knee, Nim begins to rely more and more on her new friendship with her hero and writer, as loneliness and fear begin to set in. Compounding her emotional turmoil is the close call with the Troppo Tourists boat; the people inadvertently responsible for the death of Nim’s mother. During her experience alone on the island, Nim takes comfort in the knowledge that the rugged, manly hero/adventurer/writer Alex Rover is only a click away for advice. So when she realizes Alex is an Alexandra, she is angry and feels tricked. Likewise, when Alex realizes Nim’s all alone on the island, and Selkie and Fred aren’t her brother and sister, but rather her pets, she is horrified and decides to fly to be with Nim, even though she is terrified of flying and open water. Throughout the story, there is the wonder and worry about the dad’s return, Nim’s well-being, the island’s continued secret existence, and loneliness of all three main characters: Jack’s loss of Nim’s mother, Nim’s longing for a hands-on dad, and Alex’s reclusiveness. I enjoyed this book, and loved the movie version by the same name. I actually saw the movie first, then later found out it was a book as well. The two are rather different, however, which often makes it possible to like both. Whereas the book deals with the Troppo Tourists’ discovery of the island in passing and Nim’s defense of it in a short segment, the movie’s main crisis isthe invasion of the tourists and Nim’s mounting an aggressive push of the unwanted vacationers. In truth, I liked the movie better than the book, because there’s a lot more detail to the characters’ lives. Alex Rover is more agoraphobic… pretty much phobic of everything, really, so the struggle to “be the hero of her own life” is more intense. The movie’s Nim has more depth and is more like a real girl than in the book, with the attitude of a desire for independence that most preteens have. Also, the movie’s dad seems more like a caring and concerned parent desiring the safety of his daughter than the book’s more-or-less-absentee father. I’d recommend Nim’s Island by Wendy Orr, particularly for girls ages 8-12. Maggie is rather into it, and is looking forward to finishing it. 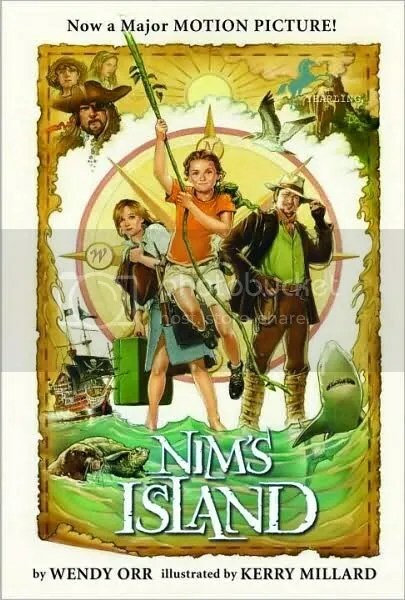 I’d give Nim’s Island three out of five stars.